Chai aka Ch. Cantabria My Cuppa Tea was from Kuka's breeding to Champ. She was a wonderful little dog, full of the pizazz that helps a dog be a successful show dog. 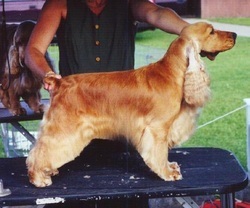 She finished her championship quickly and was WB at the BC Cocker Club Specialty at the age of nine months. She was a little lady, always demure, ready to pose for a picture anytime. Both Kuka and Chai have gone on to the rainbow bridge now. Lucy aka Ch. Cantabria Music In Motion was the offspring of a Champ son named Ch. Dawnglow Diamond in the Ruff, bred to Kuka. She was a Cdn. Ch. and had a very successful sister named Ch. Cantabria Sweet Harmony aka Tori. Tori aka Ch. Cantabria Sweet Harmony was owned by Pam and Roger Elliot in Wisconsin. She did very well and was WB at the HOM Specialty show in Michigan. 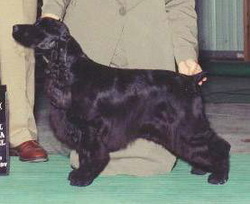 She was their first English Cocker, the start of their love affair with this breed. She is behind some nice dogs out there today. Morgan aka Cantabria Angel of Golden Gait was owned by Deb O'Crowley in Mn. 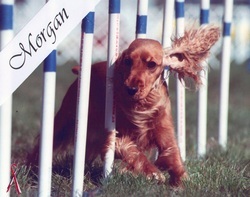 Deb LOVES agility competition, so trained Morgan, who is by Champ and out of Kuka, to do agility. She did very well for Deb, and then retired to be the mother of some nice pups for Deb. Very well loved, Morgan has now gone to the rainbow bridge and is greatly missed. Chai's first litter to the beautiful BISS Am. Can. Ch. Jerabee Hoosier Sunset, aka *Sunny* produced our Chili. Co bred by myself and Deb Owczarzak and co-owned by Mindy and myself, Chili made a major contribution to my dogs. She was a sweet funny girl, sadly she has now gone on to the rainbow bridge. Velvet could easily win a contest for the world's sweetest dog. Not necessarily the smartest dog, but the sweetest! She is also a fabulous little hunter, and immensely enjoys her daily walks in the forest where she spends a good deal of time chasing just about anything that moves and yipping joyfully the whole time! She has been shown and has done very well in her limited outings, is of beautiful breed type, and a pretty mover. Clementine is Bri's daughter, bred by Mindy Bartholomew and me. She is co-owned with Brenda Zubel, who showed her to her Canadian Championship. She has had two nice litters of pups and is the joy of Brenda's heart. Chelsea is Clem's daughter, sired by Jack, Am. Can. Ch. Calypso's Fortunate Series of Events. She is a beautiful sweet girl, and lives with a family of her own. She has not been shown much but we hope to finish her in the near future. She lives in a family with three kids and her temperament is wonderful. See the puppy page as Chelsea is due to have pups in May! Chona is our family pet. My husband adores her, as do I. She and Velvet are BFF, and go out walking and chasing squirrels and birds at least a few times a week. 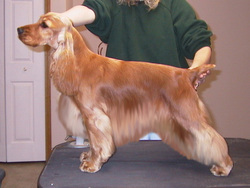 She was a very successful show dog, who finished with some quality major wins in California, and did wonderfully well to finish in Canada. 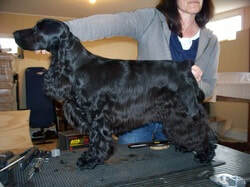 She is a Chili daughter, sired by the beautiful black and tan dog Ch. Dawnglow Checkerboard. From when she was a baby, you could pick up her leash and she carried herself and moved like few other dogs. She was all show dog. Unfortunately, although we tried a number of times, Chona never had any pups. Scout is also a Chili daughter. She was not, however, a fan of the show ring. 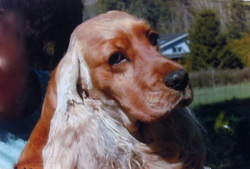 After a few outings, she decided to stay home and has been well loved by the Meadows family in Victoria, BC, throughout her life. 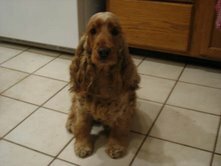 She is a very correct and pretty English Cocker, with the typical quirky ECS personality. She has had two litters of pups as I wanted to preserve her many good qualities for subsequent generations. She is now retired.